>b>If you find yourself in this situation, it means that your caregivers are at least being straight with you in telling you that you do have options. In the past, too many men were not given a choice and too many learned after the fact that a different treatment approach may have been better for them. The fact that so many different options exist is a good thing; it is evidence of advances being made in prostate cancer treatment throughout the world. With increasing awareness of this disease, pressure has been put upon research scientists and physicians to develop more effective (and less damaging) treatments that not only cure the cancer but preserve the patient’s quality of life. 1. Be Aware of Physician Preference. You must realize that whichever treatment a physician was trained in and whichever one he currently offers, will be the one he most often recommends. Urologists are surgeons – they believe in surgery (and they make their livings by performing surgery). Likewise, radiation oncologists are trained in using radiation, that is what they believe in and that is what they do. In simplistic terms, you are “shopping” for treatment, much like you would shop for a new automobile. The most direct way you can learn about a particular car is to visit that showroom. An indirect way is to talk to someone who has bought the car you are interested in. You can’t expect the Ford man to tell you the good things about a Chevrolet. You must go to the source – and the same is true for prostate cancer treatment. The wise course of action for most patients is to obtain second and third opinions from doctors of different specialties (i.e., urologists, medical oncologists, radiation oncologists). 2. Don’t be Afraid to Ask the Tough Questions. You have every right to know the answers and to expect a standard of care with which you are satisfied. Don’t be afraid to voice your concerns. You don’t have to be polite to doctors. Ask about the doctor’s experience – how long has he/she been performing the treatment? How many men has he/she treated? How many men with similar disease as yours has he/she treated? What are the success rates of this type of procedure? What are his/her success rates? Are these success rates published anywhere? Are they peer-reviewed? (Edited and approved by members of the medical profession.) How does the physician define “success?” What are typical side effects, and how often does his/her patients experience side effects? 4. Network. There are several large, nationwide support groups for prostate cancer patients. Call your local ACS office and inquire about a Man-to-Man group in your area. Us TOO, International is another network of support groups. You can go to their website to locate a chapter close to you: www.ustoo.org Attend at least one meeting. This is the very best way to learn about physician practices in your area. At these meetings you’ll find men who have been treated with many different protocols. If they are at the meeting, they are willing to talk. Ask them about their experiences and ask them if they would choose that treatment again if they had it to do over. In addition, PAACT (Patients Advocates for Advanced Cancer Treatments – www.paactusa.org) publishes a quarterly newsletter that is very helpful. 5. Research. If you are computer savvy, go to the internet. If not, go to the library. There is a great deal of information out there, and at times it can be overwhelming to absorb along with the information you’re receiving from your doctor. It’s important to remember as you conduct your research to be cautious about what you read in the media and on the internet. 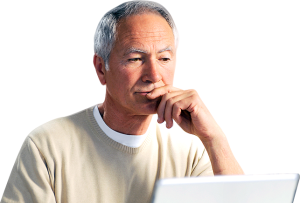 There are many misconceptions and errors of fact about prostate cancer that find their way into the media, including many of the popular websites and patient blogs. Also, remember that just because something is “new” doesn’t mean it is better or has actually been proven to be effective. Do your own research (“due diligence”) and don’t delegate your treatment choices to others. The most trusted sources are peer-reviewed medical journals and books for the lay audience written by reputable physicians. You will eventually want to place your confidence in the hands of an experienced physician who can show you his or her track record. You deserve nothing less. 6. The Bottom Line. Before making any decision about treatment, you should carefully evaluate the likelihood of cure for each treatment option and the risk of side effects that may alter your quality of life. Taking into account your age, overall health, and the extent and aggressiveness of the cancer, you will want to find a balance with which you are comfortable and can live with before, during and after treatment. Regardless of the type of treatment you decide is right for you, having a positive mental outlook and knowing what to expect each step of the way are keys to winning the fight against this disease.